MSC Cruises, the Geneva-based global cruise line, has unveiled ambitious plans to create an unprecedented exclusive marine reserve island experience in the Bahamas. The visionary project was officially launched in the Bahamian capital Nassau, where prime minister Perry Christie and MSC Cruises executive chairman Pierfrancesco Vago signed a 100-year lease agreement that will enable MSC Cruises to occupy and develop the island, to be called Ocean Cay MSC Marine Reserve. Over the next two years MSC Cruises will work hand-in-hand with the Bahamian government and ecologists to develop the cay, a onetime sand extraction station, into a thriving marine reserve that will harmoniously coexist with the local ecosystem. It is hoped this is a project will transform the local economy base from resource exploitation to resource conservation. MSC Cruises is committed to protecting the waters it navigates and, as one of the most ecologically conscious cruise lines in the world, will invest around US$200 million in creating a flourishing natural haven from a desert island. Vago commented: “This is a natural progression for our company, which is growing very rapidly, and we are thrilled about providing this totally new experience for our guests in the Caribbean. “Ocean Cay MSC Marine Reserve and its exclusive offerings will be a magnificent extension of our shipboard experiences. “We are scrupulous about ensuring every decision we take keeps each of our ships true to the promise of our brand, offering the authenticity and quality our guests expect. “This is what made us the leading brand in many of the markets we operate, including across Europe, South America and South Africa. 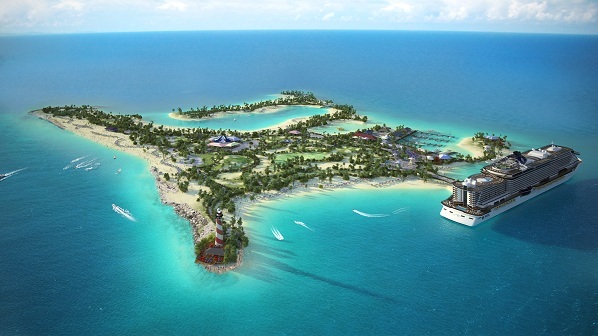 As well as being the only marine reserve island experience, at 95-acres in size, and with 11,400 feet of pristine beach front spread across six distinct beaches, Ocean Cay MSC Marine Reserve will be – by a large margin – the biggest island development by any cruise company in the Caribbean. In addition, it will offer a multitude of other key distinguishing features. For example, a purpose-built berth and pier right on the seafront means that MSC Cruises guests will be able to step off the ship straight onto the island. This unique feature also means guests can move at leisure between ship and island, which will be especially useful since a key part of their visit will be the island’s night life, in particular live music and entertainment at the 2,000-seat amphitheatre, and many restaurants and bars. In addition, the ship and all on-board services – including the casino – will stay open while berthed at Ocean Cay MSC Marine Reserve. The Ocean Cay MSC Marine Reserve project will offer a permanent MSC Cruises presence in the Bahamas, for which the Company plans to recruit 240 Bahamians in various roles over 2016 and 2017. The cay will be ideal for all MSC Cruises ships serving the Caribbean region, notably MSC Divina and the under-construction next generation ship MSC Seaside (launching December 2017), both sailing from Miami, plus MSC Opera and MSC Armonia, sailing from Havana, Cuba. In addition, the Company will open a crew training school in Nassau to provide local manpower for the growing number of MSC Cruises ships sailing the Caribbean. In the meantime, on 15 December MSC Cruises announced the opening of sales for the inaugural December 2017 cruises on MSC Seaside. Guests aboard MSC Seaside’s maiden voyage from Miami will be the first to visit the island and revel in the location’s abundant offerings.